After the hustle and bustle of the holidays is over, there must be some kind of treat that you can give yourself that will last outlast most of the other presents. If you are clamoring for a simple renovation to your kitchen because you’re a gourmet cook or a gourmand, what would you opt for? New flooring – nah, that’s boring. New lighting – nope, that can be done any old time. A fresh paint job – hey, that’s kid stuff. How about state-of the-art beautiful counter tops? Would that make you happy? Well, … now you’re talking. If you’ve researched at all into trending kitchen counter tops, you’ll see there are a wide variety to choose from. 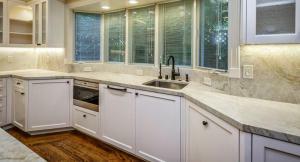 If you’ve perused any home remodeling sites, you’ll see that granite counter tops cornered the kitchen renovation market for many years, but their popularity has waned somewhat. Though there is still demand for gleaming granite counter tops, there are less-expensive, yet similar-looking options, which require less maintenance and will still give you a beautiful look to enhance your kitchen. First of all, the installation of any counter top should be considered a relatively large renovation project and would therefore be best done by a contractor who specializes in kitchen remodeling in Cupertino. That way, the project will be done in a tip-top manner and you will receive instructions on the care and treatment of your counter top going forward, so it can last you for years and still be looking good. You may want to peruse the available options for counter tops, bearing in mind that you will need to harmonize the counter top with the rest of your kitchen, color-wise and style-wise. A modern kitchen with its streamlined and efficient look needs a complementary type of counter top, whereas a country-style kitchen which oozes a down-home aura of comfiness, would be better suited with a butcher block counter top. Your kitchen remodeling consultant will be able to tell you the best style of counter top for your kitchen size and shape because all those facts need to be taken into account first. Granite counters are the granddaddy of all counter tops trending today. Although granite has somewhat fallen from grace, due to its weight, which is extremely heavy, and thus doesn’t permit installation on every counter area, and its price, which is quite high due to the cost of mining and obtaining this natural mineral. The cost is coming down gradually however, so, if you really want a granite counter top, hang on a little longer. For example, in recent years, a large number of new granites and marbles at very competitive prices have appeared in the natural stone market. They originate from countries like China and India. Of course, this has forced natural stone producers in Europe and the United States to reduce their granite and marble prices to be competitive. Granite is beautiful and very durable but to keep those characteristics there is maintenance involved such as annual refinishing and resealing. Soapstone counters are popular today for those homeowners who want the real deal – natural stone. Like granite, it is durable, and it is available in its natural color, a gray which will blend with any kitchen. It will darken as it ages but will keep its beauty through regular buffing and special oils. Butcher block counters are the perfect complement to the country kitchen. If you are looking to add a rustic look to your kitchen, hard floor floors with matching butcher block counters will be sure to get you there in a heartbeat. Butcher block counters are extremely durable, and, if maintained properly, a minimal job of sanding and rubbing down with oil periodically, they will age gracefully and give you plenty of years of use. Stainless steel counters are prized for their durability, easy maintenance and ability to be resistant to such culprits as heat, corrosion, rust and best of all – stains. It is as easy to clean as your stainless steel pot or your sink; just a touch of soap and water and a quick buff with a dish towel will keep it looking like new for many years. Synthetic materials for counter tops are likewise considered durable. They are not your mother’s counter top by any means. They are comprised of acrylic or polyester resins and are simple to keep clean and bacteria-free. They may be purchased in solid colors to harmonize with your kitchen, or, if you covet the natural stone counter top look, but cannot afford that pricey material, then you may purchase counter tops made to resemble granite and marble. Not only do you get “the look” but you can forget about the annual maintenance associated with natural stone counter tops. Synthetics are such a deal, don’t you think? Ceramic tile counters are an excellent choice if you are prone to dropping or damaging the counter top area, inadvertently of course. Damaged or aging tiles may be replaced with new and identical tiles. Please remember, however, that unless you replace the tiles relatively quickly, the old tiles will already have started to fade or deteriorate, ever so slightly, and don’t forget about the surrounding grout which also will show its age after time. New tiles and new grout work inevitably will stick out like a sore thumb. Ceramic tiles, though the cheapest option for counter tops, eventually will lose their high gloss after scrubbing them to keep them bacteria free and pristine. Paper composite counters are an excellent idea if you are into the natural and green home aspect. These counter tops are comprised of resin mixed with post-consumer recycled paper and fibers. Granite tiles are wannabe granite counter top options. Instead of a slab resting on cabinets to provide the counter top area, you get genuine granite tiles, purchased in 12-inch squares, and they are lightweight in comparison to the granite slab. All of these trending counter top options are available for your consideration and a consultation with a kitchen remodeling expert will help you plan the project and get the best results for your kitchen.